The PNWS is divided into twelve subsections whose purpose is to bring the training and networking closer to you, our member! Each subsection has regular meetings providing direct support to members and water professionals within their local county or city. See the subsection by state below. 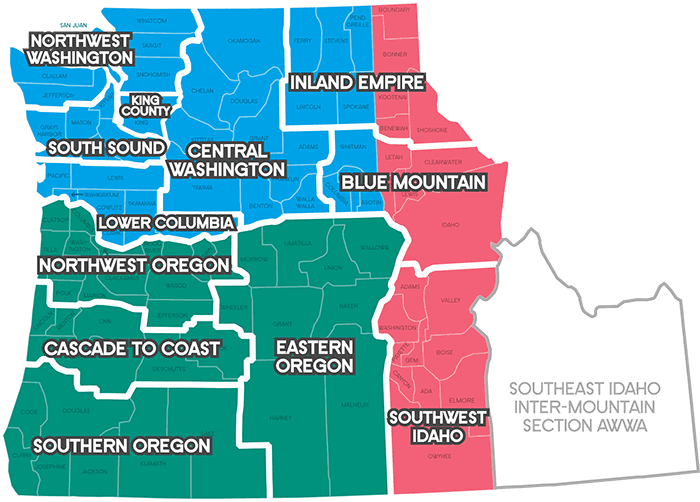 Join Your Subsection – Our Pacific Northwest Section provides all of the association trainings and activities within the states of Oregon, Washington and a portion of Idaho. To provide more close to home/regional opportunities for our members we have created 12 subsections. Subsections are a great place to meet your local water professionals, get your CEUs and have fun within a few miles of your home and/or office. These 12 subsections have their own officers that manage the day to day activities of their regional area. On this subsection webpage you will find a listing of our subsections and their current officers. Reach out to your regional officers and let them know you want to get involved!